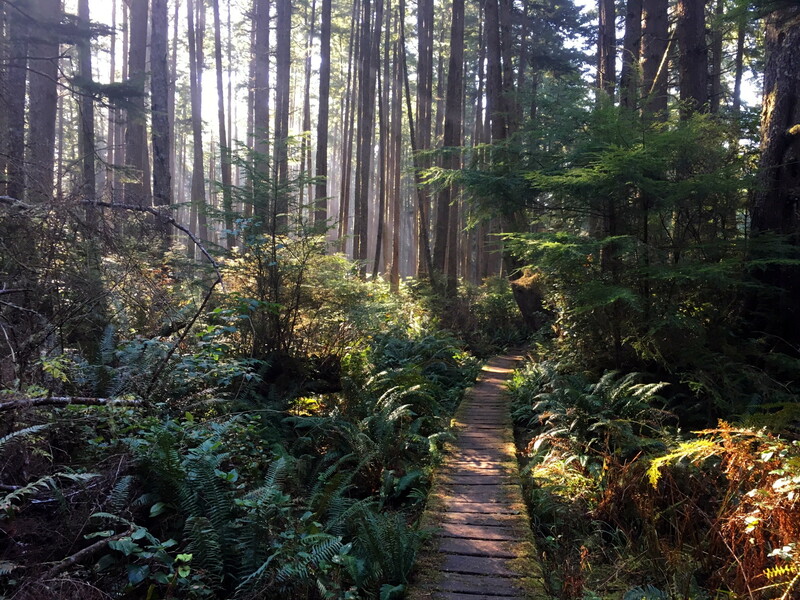 If you like walking on boardwalks through green tunnels, beach hiking, exploring tide pools, solitude, having campfires on the beach, or just need an excuse to slowdown, you will love hiking along the Washington coast! 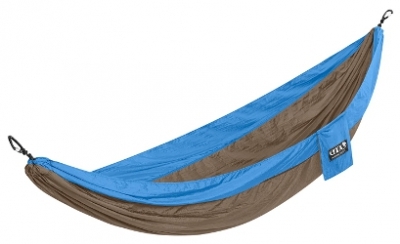 We did a short, one night, backpacking trip, but you can also do day hikes or week-long backpacking trips. Read below to learn about tidal constrictions, acquiring a wilderness camping permit, what you should pack, or hiking distances/terrain. You can also read about and view photos from our trip. We arrive at the ranger station first thing Saturday morning, ready to get our backcountry permit and head into the backcountry for the first glimpse of sunshine in weeks. 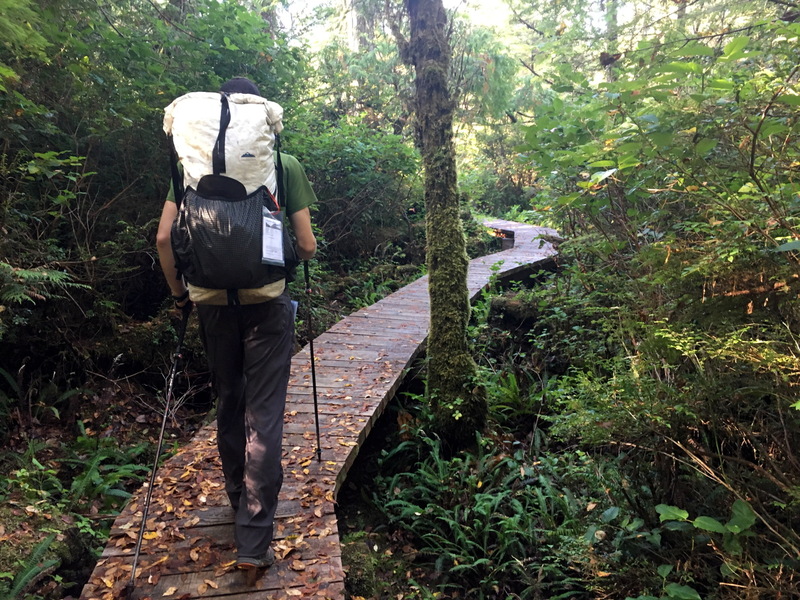 We tell the ranger of our plan to backpack 19.8mi, from Ozette to Rialto Beach, and complete a loop by biking back to our car, another 27.4mi on logging roads. He responds, “I’m sure you’ll have no trouble with the distance, but the tide constrictions may make it hard to do this in two days.” On past backpacking trips, we had never had to think about being cliffed out during high tide because we had always gone into the mountains. We make adjustments, planning to hike the first 1/3 of the Ozette Triangle, then south to Yellow Banks, where we will sleep for the night. The next day we will plan to hike back north, traveling the other 2/3 of the Ozette Triangle and then returning to our car. 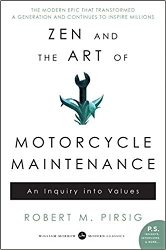 Now that we have secured our permit and scrambled together a plan. . .we get back in our car, gather some provisions in Port Angeles, and begin our two hour drive to Ozette. The roads are extremely windy and have a caution sign for landslides every couple of miles. The drive consists of patchy clear cut mountains, with private gated logging roads leading up to them, the occasional rundown house, and small patches of mossy old trees. The remoteness of this area is magical. 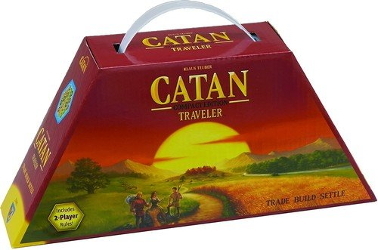 When we arrive, we begin to slowly pack, intentionally trying to get a late start, so that the tide will be lower by the time we arrive at a constriction. 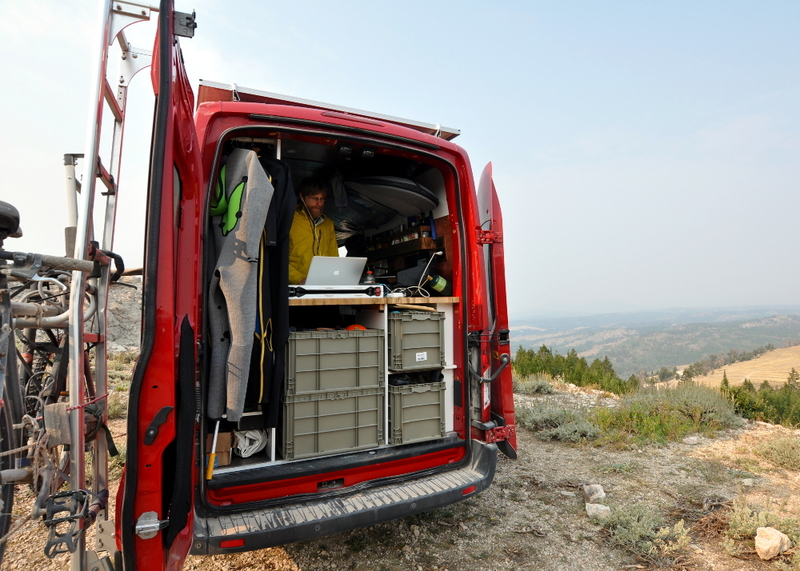 We plug in our headlights, camera batteries, and cell phone, letting them get the last bit of juice from the sun before heading out. We have gotten so used to packing for these sorts of adventures and so comfortable with these shorter, low-risk backpacking trips that we don’t even need to pull up our packing list off of our phone. 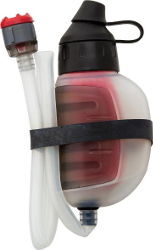 If we forget something, we’ll be able to make do. It’s 1pm now, so we decide to set off. The beginning of the hike is in a tunnel of green with old growth mossy pine trees towering over us. The trail consists of rustic, feng shui boardwalks. We pop out of the tunnel and onto the sandy beach. Just as I had imagined, there are uninhabited, bulbous rock islands out in the ocean that are covered in old growth trees. At this point, we realize that it hasn’t been raining on us all morning. The past two weeks had been rain nonstop. Hiking through a tunnel of green with old growth mossy pine trees towering over us. Rustic, feng shui boardwalks, along the first 1/3 of the Ozette Triangle. Bulbous rock islands, along the Washington Coast. We round the corner and head south. No one for miles! I always envisioned Washington’s coast being like most other US coast lines. . .covered in people: visible roadways paralleling, mansions built into the cliffs, boardwalks extended past the horizon, or just private land that makes it hard to access. Fortunately, Franklin Roosevelt had the foresight to make this stretch part of Olympic National Park. Such a magnificent place! The Washington coastline looking north. Despite how few people are here, there is still trash that has washed up on the beach, which mainly consists of pallets, fish nets, and buoys. It’s always impressive how in the remotest of places you still find garbage from people who have never been to the area, generally in the form of balloons. To our left is the green forest with rocky cliff line and sandy bluffs, forming a wall that drops down to the beach, and on our right is the ocean waves breaking in large periods forming beautiful sets. At this point, we are wishing we had lugged our surfboards along. 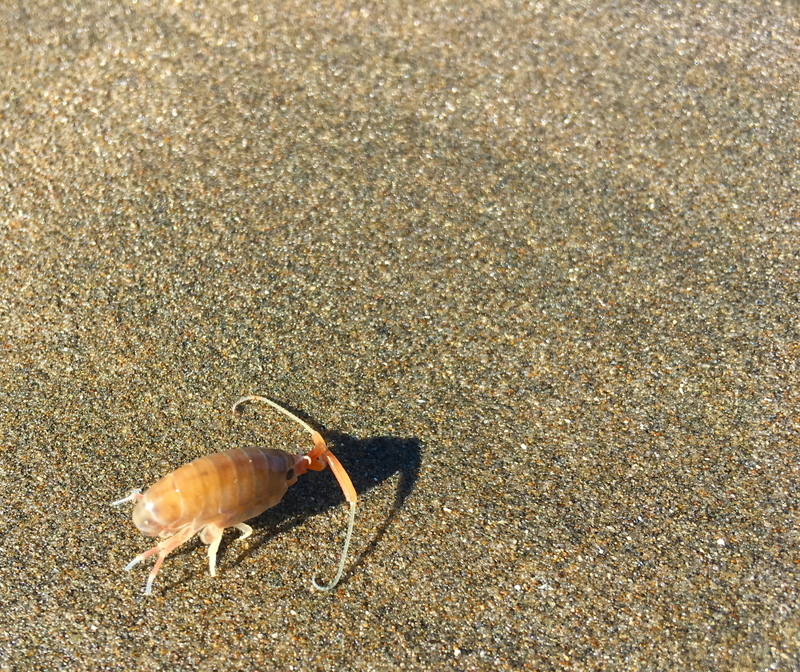 We get to the first tidal constriction and our first set of tide pools. . .so much wildlife both dead and alive. 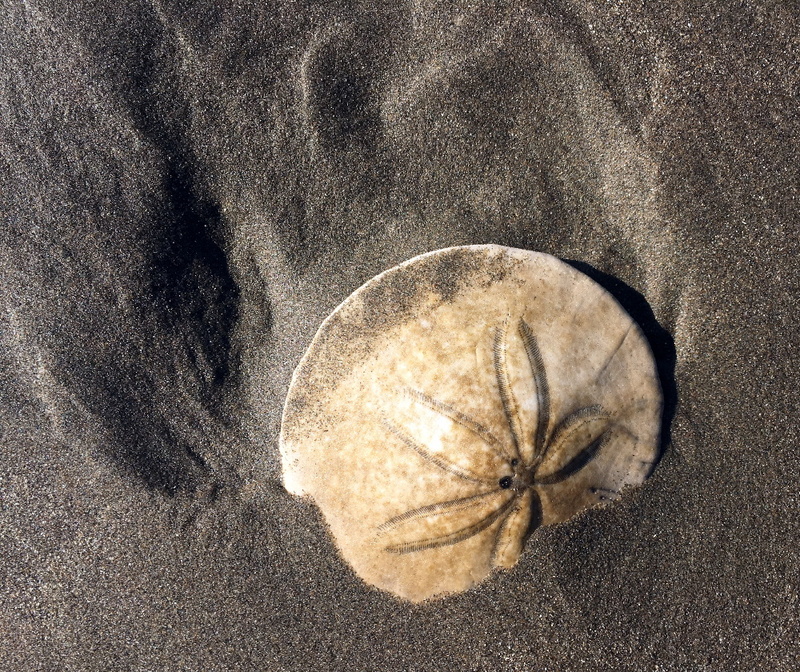 The tide pools in Washington actually have life in them! Living in Maine, we were always disappointed when we looked in tide pools and found nothing. 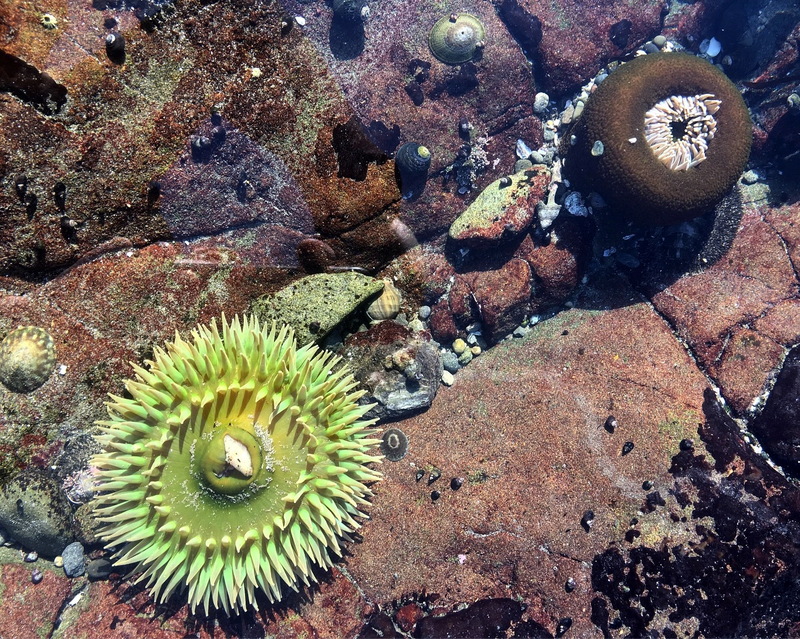 Looking in the tide pools, we first see closed up green donuts, which we later learn are solitary anemones. We soon find some that are open and discover their magnificent colors. . .fluorescent green in the center and firery red at the tips. Philip touches one and quickly pulls away because of their foreign sticky barb feel. Solitary anemones are poisonous to some critters, but harmless to humans. Closed and open solitary anemones in a tide pool. We arrive at our campsite at 2pm. The earliest we have ever ended a day of backpacking. 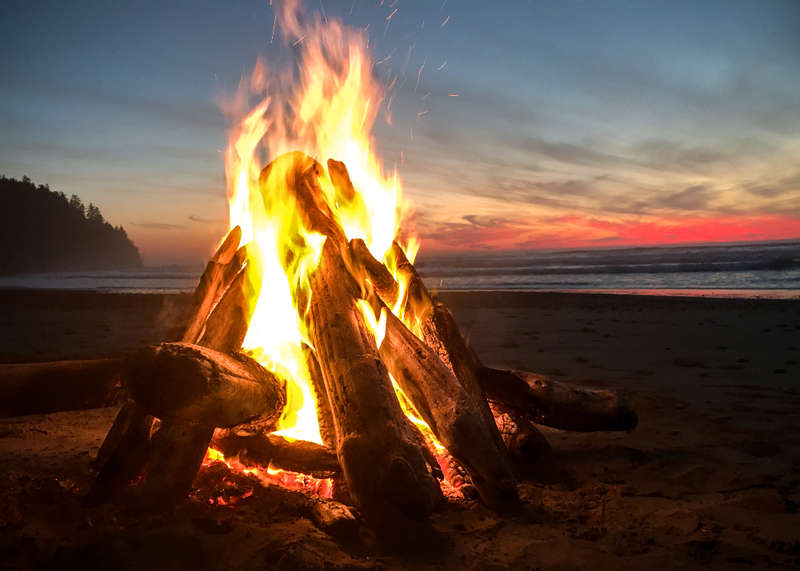 Remembering that we are allowed to have a fire below the high tide mark, have tons of drift wood, and lots of time, we begin to build a fire! Another first for us. Being poorly experienced in this type of backpacking trip, we didn’t think to bring a book, game, or a group of friends, so we are left with our own thoughts, each other’s company, and the best high definition tv channel. . .NATURE. For the rest of the afternoon, we sit by the fire and watch as the waves fade into a beautiful sunset.Despite how nice the van is, it is hard to beat this. Sitting by the fire and watching as the waves fade into a beautiful sunset. After getting another slow start, we have breakfast, pack up our camp, and get on our way. We hike the familiar section from Yellow Banks to Sand Point. From here, we get into new terrain, hiking along the coast towards Cape Alava. This section is a lot more rocky and covered in slippery ocean debris that has washed up, making for a slower section. But, before we know it, we are back in the woods walking on wooden boardwalks and then back at the car. 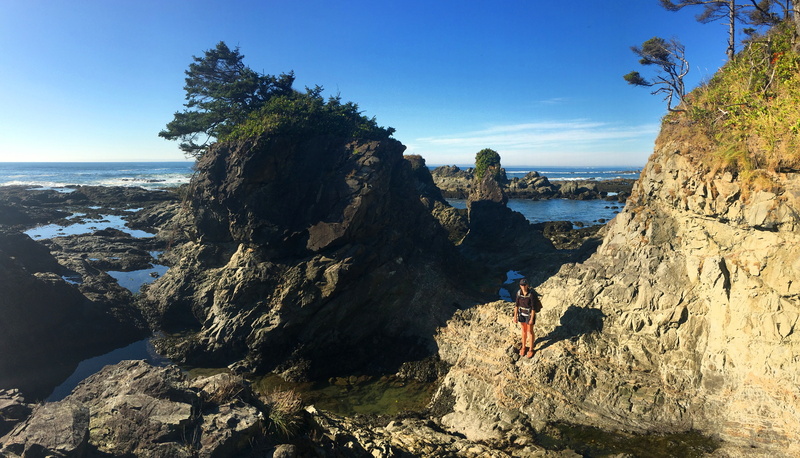 Olympic National Park’s rocky coastline. 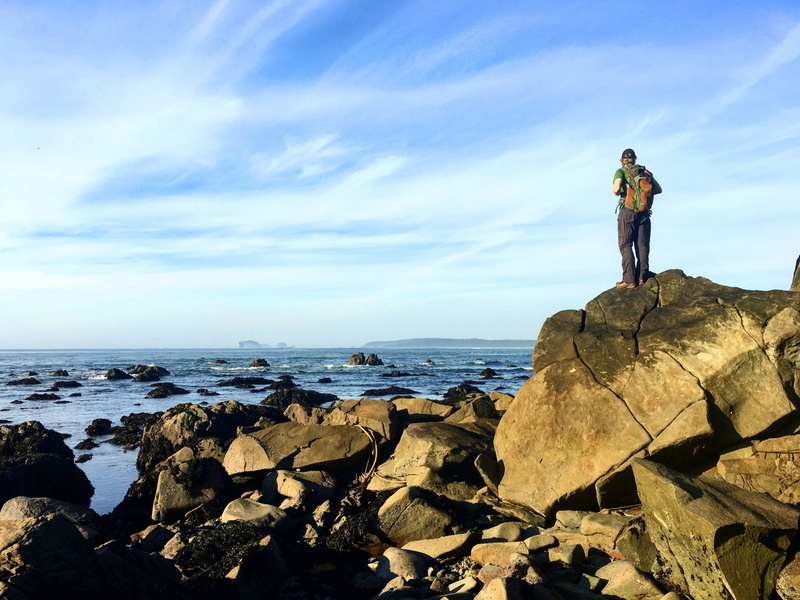 Hiking the second 1/3 of the Ozette Triangle from Sand Point to Cape Alava. This trip was particularly memorable and one that I highly suggest to anyone whose been needing an excuse to slowdown. 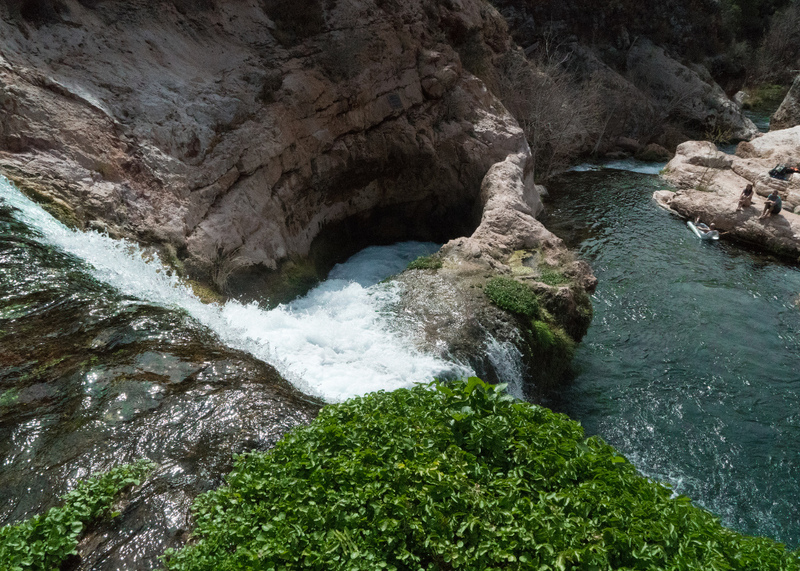 We hate planning too much ahead of time, but, due to tidal constrictions along this hike, if you want to get a lot of mileage in, planning is a really important step! 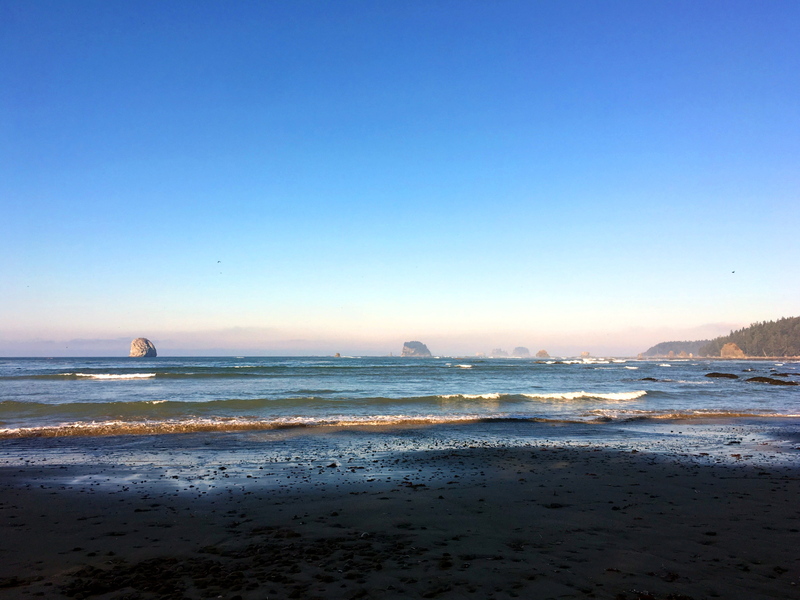 Originally we had planned a three day trip, hiking Olympic National Park’s coastline from the Ozette Ranger Station to Oil City Trailhead and then biking back to our car via roadways. After explaining our plan to a ranger, we were educated on tidal constrictions. 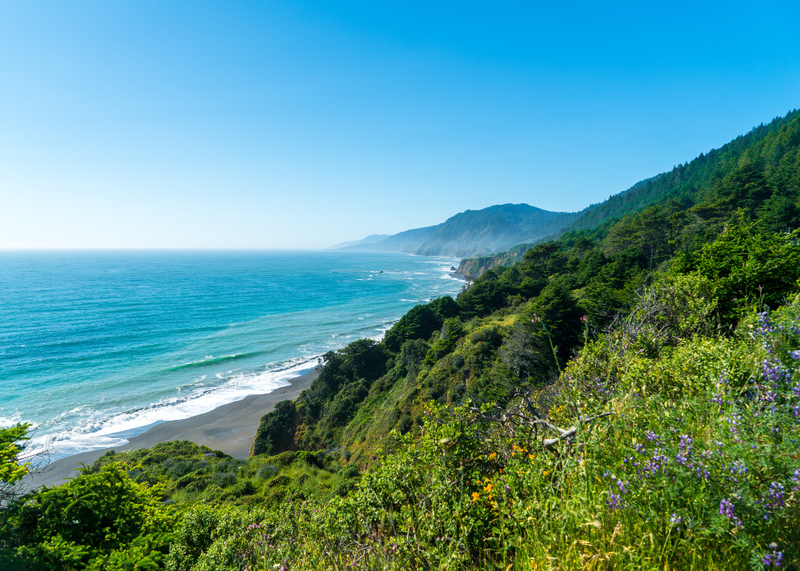 Along the coast, there are sections of cliff line that become impassable during high tide, unless you want to swim in the water or hike up onto the bluff and around them. 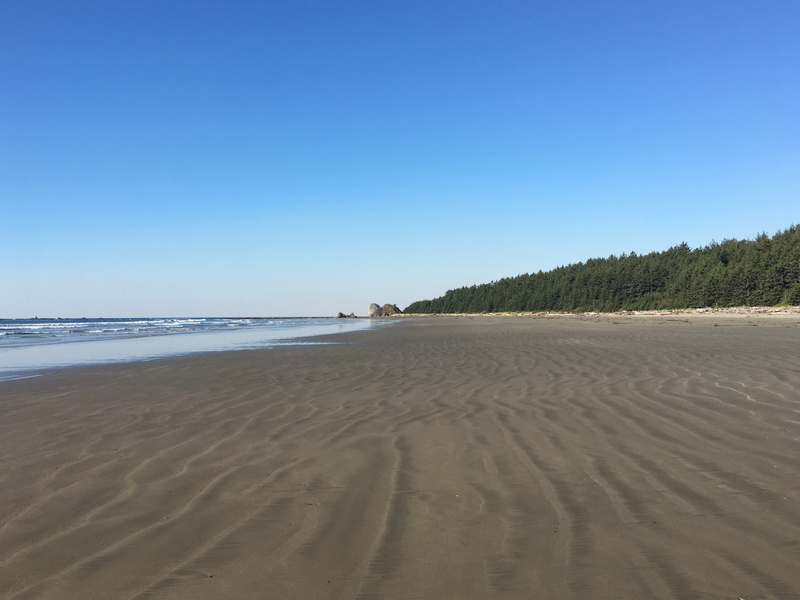 So, depending on how you are able to time your hiking with the tides, you could end up waiting awhile for the tide to lower before passing some of these constrictions. 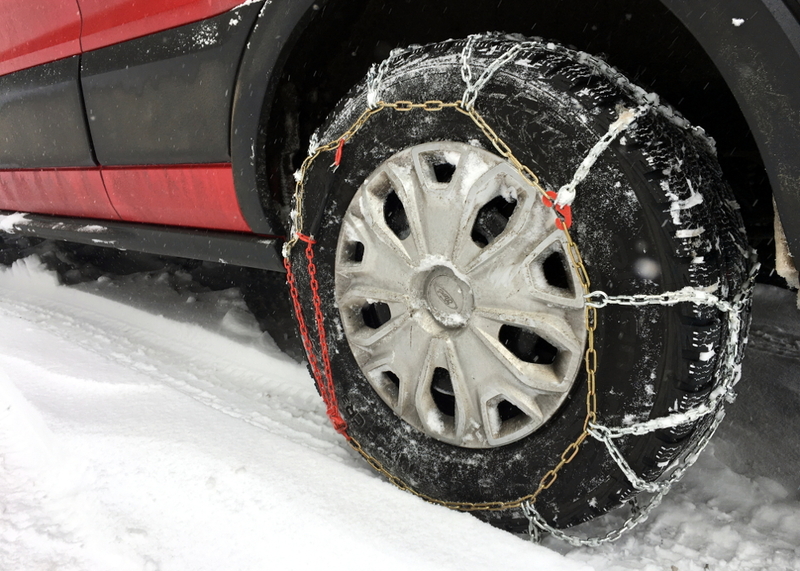 Given our time constraints, we decided to come up with a shorter plan. . . This is the ultimate map to have for hiking along Olympic National Park’s coastline. This map includes tide constriction markers (ex. “CAUTION: 5 ft tide“), which tell you at what height above sea level a section of coastline becomes impassable. 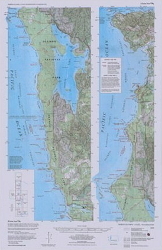 These maps can be bought at the gift shop across from the Wilderness Information Center in Port Angeles or online. 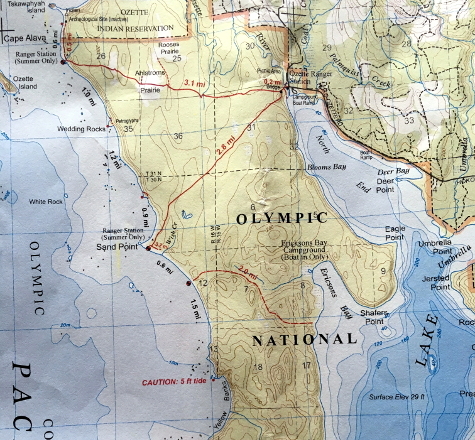 Left: Example of tidal constriction marked on the Custom Correct North Olympic Coast Map. The tide table that the park provides is for the whole month, condensed into one page, and on paper that isn’t waterproof. Their table works, but, if you want something better, I’d suggest printing one out before you go or having it on your phone. 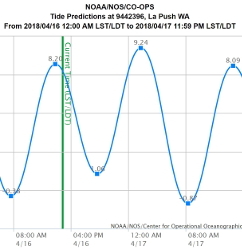 Additional tidal information can be found on Olympic National Park’s Tides and Your Safety webpage. 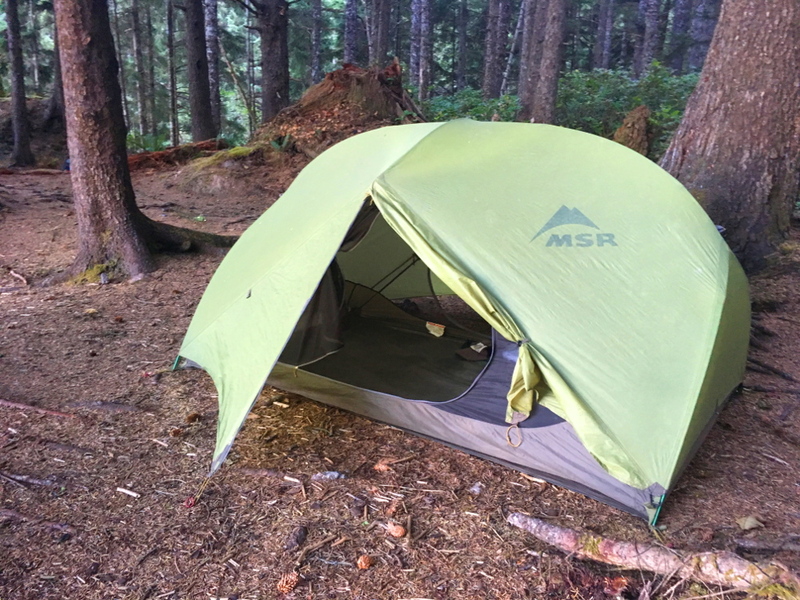 In order to overnight camp/backpack in Olympic National Park wilderness (backcountry), a permit is required. 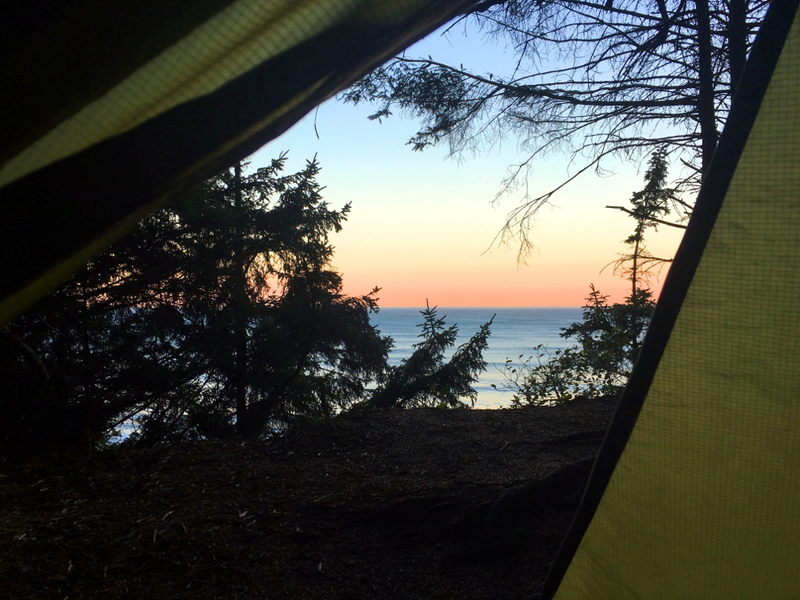 If you want to reserve a permit ahead of time by completing a reservation request, I strongly suggest using the Custom Correct North Olympic Coast Map and a tide table to aid in strategically selecting your campsites. 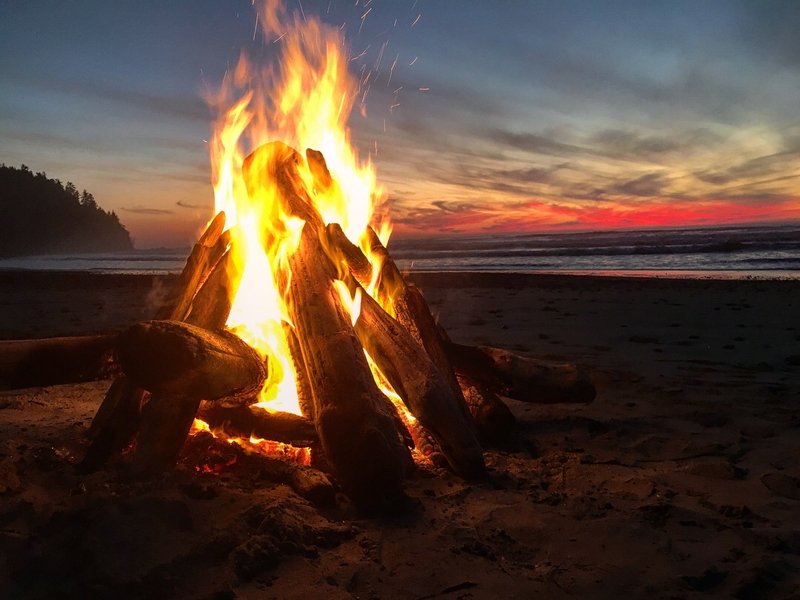 Some of the most important things to bring for backpacking on the Washington coast (+ some fun things for your free time).